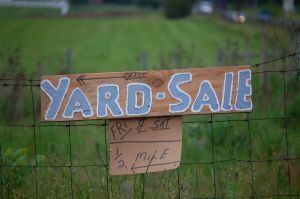 In theory, throwing a yard sale to clear your clutter might sound like a good idea but when you get down to the actually work, it becomes extremely tedious. Even after hanging up all the posters, waking up early to drag everything out of your house and spending the day sitting by your junk there is still no guarantee that you’ll get rid of everything. That means dragging it all back in at the end of the day. Mission not accomplished! A better approach to clear your clutter would be to have it all removed in a matter of minutes. That can happen when you reach out to Junk King. Junk King Capital District is part of a national chain of professional junk haulers who can help you avoid the frustration of a failed yard sale. When you set up a junk removal appointment with Junk King, you’ll have at least two strong movers at your disposal. This will be the team that will do all the actual removing of your junk. You won’t have to drag anything down to the curb! Instead, you’ll just be pointing to the stuff you want removed. That includes anything you want gone that is down in the basement or up in the attic. The Junk King crew will be happy to climb those stairs! Clearing your clutter isn’t limited to the stuff you have on the inside of your home. The Junk King crew can do some amazing clearing work around your yards. After all the severe storms this past winter, you might have some objects that need to be tossed out like rusty patio furniture or crusty BBQ grills. Get your yard in shape with a little help from Junk King. When it comes to rates, you’ll find that Junk King’s pricing policies are the most affordable and competitive in the Capitol District. You’ll only be charged a flat rate based on the volume of your junk. It’s not about how much it will weigh but how much space it takes up on the back of the truck. This is an extremely fair approach for this kind of service. Because Junk King does a lot of recycling, they can avoid the costly dumping fees at a landfill and they are happy to pass those savings onto you. When you’re ready to clear your clutter, Junk King will be ready to help! This entry was posted in Clear Your Clutter and tagged Clear Your Clutter, Junk King, junk removal on April 30, 2015 by Todd Porter. Last updated August 1, 2017 . Are you thinking about upgrading your computer monitor or printer this year? If so, then you’re in for a treat at the latest models promise faster processing and more vivid images. You might not want to go shopping for these items unless you plan on buying. That’s because one look at the new gadgets will have you wanting to kick your old ones to the curb right away. Technically, you can’t put these items on the curb. 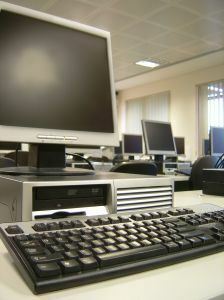 They have been classified as e-waste and according to a new law, it is illegal to dump these things into a landfill. They have to be recycled by a certified facility. Your best option to get rid of these items would be to turn them over to Junk King. They’ll know how to handle all your e-waste. Although your computer monitor and printer are perfectly safe in your home, it’s when it is left to decompose that problems arise. If the screen is broken or the other components are left to rust away, then there is a chance for harmful chemicals to be released in the soil. A little rain and that soil runoff can make its way into our drinking water. That’s why so many old landfills have been designated hazard zones and are now requiring cleanup. It’s also why New York enacted tough new e-waste recycling laws. Junk King is well aware of these regulations. Of course, they’ve been proud partners in e-waste recycling since the company began operations back in 2005. When you call on Junk King for any type of junk removal, they will be making their best effort to recycle the bulk of what they collect. That especially applies to computer monitors, printers, fax machines, laptops and any other piece of equipment. Junk King has developed terrific working relationships with all the certified recycling centers around the area. Once they’ve collected enough e-waste to fill a pallet, they’ll make sure those items get dropped off at those facilities. The good news is that you won’t be paying any extra for the drop off. Your flat rate will only be based on how much space your junk takes up on the back of the truck. Whether you’re tossing out a single computer monitor or a whole garage full of rubbish, Junk King has you covered. This entry was posted in Computer Monitor & Printer Recycling and tagged Computer Monitor, Junk King, recycling on April 23, 2015 by Todd Porter. Last updated August 1, 2017 . There are many factors that contribute to a home’s value. Size matters, of course especially as it relates to the number of bathrooms and bedrooms. Whether or not a kitchen or bathroom has been remodeled can also have an impact on a home’s value. 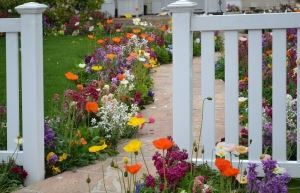 Obviously, the first thing that most prospective buyers will notice is the curb appeal. This is all about lawn care, garden planting and paint jobs. Even if you have no intention of selling your home, you would still benefit from improving your curb appeal. That is where Junk King comes into play. Junk King is the leading professional junk removal service in the Capital District. This is a common occurrence for every Junk King franchise. Although they specialize in removing items like old furniture, appliances and household goods, Junk King is also a perfect partner for a landscaping makeover. They might not do any planting or lawn mowing but they can certainly clear the way for that kind of work to be down. Removing yard waste can be dirty business. That is not going to be a problem for Junk King. Not only will they have the right tools to get the job done, they’ll also have the right attitude. When the two-man Junk King team arrives at your home, you’ll show them what you want removed or pulled up. This can be anytime of overgrowth covering your lawn or the side of your house. Junk King can also take away heavy objects like stones, brick, concrete and wood from a deck. You can see how removing those kinds of things will really help you with your curb appeal makeover. Obviously, if you have some piles of rubbish, those should be removed, too. Junk King will be happy to take away construction waste, rotted lumber, auto parts, tires and any other eyesore on your property. When they are finished with the yard waste removal, be sure to get Junk King to take away all the clutter from the inside of your home. In a single appointment, you can remove any amount of unwanted or broken item no matter the weight or the size. Best of all, you can probably make this whole thing happen within 24 hours of placing your first call to Junk King. Improving your home’s curb appeal starts with a call to Junk King. This entry was posted in Improve your Curb Appeal and tagged curb appeal, Junk King, junk removal on April 1, 2015 by Todd Porter. Last updated August 1, 2017 .